Save the Date - Registration Now Open! Registration is Open for POMA's 111th Annual Clinical Assembly & Scientific Seminar! The POMA Clinical Assembly Committee has been hard at work planning POMA's 111th Annual Clinical Assembly! Our four-day conference is complete with educational sessions, workshops, exhibits, business meetings and social functions. In total, 34 Category 1-A AOA CME credits are anticipated for this year's program. 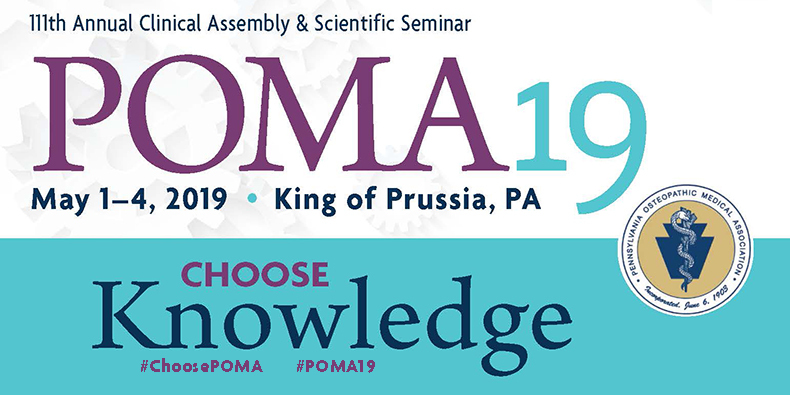 POMA19 features expert speakers who discuss cutting-edge medical updates, lectures applicable to Pennsylvania licensure requirements and relevant information to help you provide the best possible care to your patients. Click here to view the schedule of events. POMA is accredited by the American Osteopathic Association to provide osteopathic continuing medical education for physicians. POMA will report CME and specialty credit commensurate with the extent of the physician's participation in this activity. Attendees may register online by logging into the POMA website. CLICK HERE TO REGISTER NOW. If you have any questions, contact Deb Cargill-Roan at 717-939-9318 ext 170 or email [email protected]. Early-bird pricing is available until April 1, 2019! The Radisson Valley Forge & Valley Forge Event Center is host to POMA19. The conference site has two hotels, which are connected with interior access. Room blocks are available at both the Radisson Hotel Valley Forge and the Valley Forge Casino Tower. To reserve your room in the Radisson Hotel Valley Forge, click here or call (800) 333-3333. To reserve your room in the Valley Forge Casino Tower, click here or call (800) 596-0341. If you have any questions, please contact Deb Cargill-Roan at 717-939-9318 ext 170, email [email protected] or visit www.poma.org. Be sure to follow us on social media for all the latest updates! We look forward to seeing you in May! The 2019 POMA Clinical Assembly is your opportunity to reach over 1,500 DOs to promote your latest and most relevant products, technologies, therapeutics, services and resources! Exhibit registration for POMA19 is now open! Learn more in the exhibitor prospectus and complete the exhibit contract to save your space today! A variety of sponsorship opportunities are available for POMA19. Click here to view the sponsorship info sheet and contract. Product theater luncheon opportunities are available every day during POMA19. Click here to view the product theater info sheet and contract. Only four slots are available - don't wait! For more information on any of the exhibitor or sponsorship opportunities, please contact POMA Exhibit Coordinator Amanda Pezzuto at (617) 529-2560 or email [email protected].